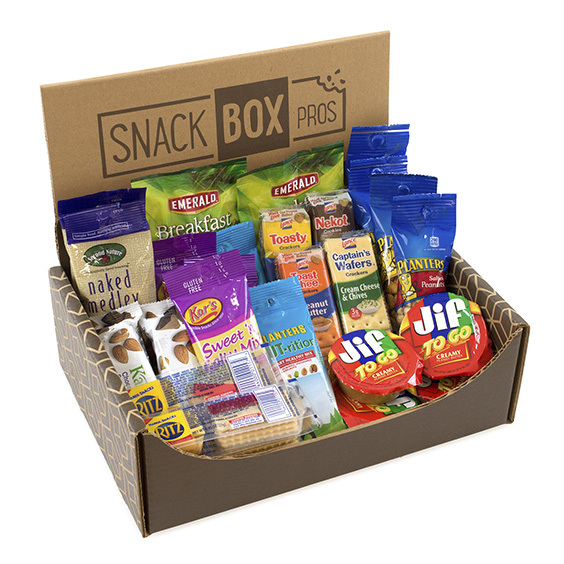 When it comes to choosing the right snack box for you, SnackBox Pros makes it easy by offering many featured snack boxes. Gluten-Free, Protein, Healthy, Organic, On-the-Go, Breakfast...with our variety of featured snack boxes, Snack Box Pros has options to fit your needs! Trying to give up junk food, or struggling with that diet? This Healthy Snacks Box is a great place to start! 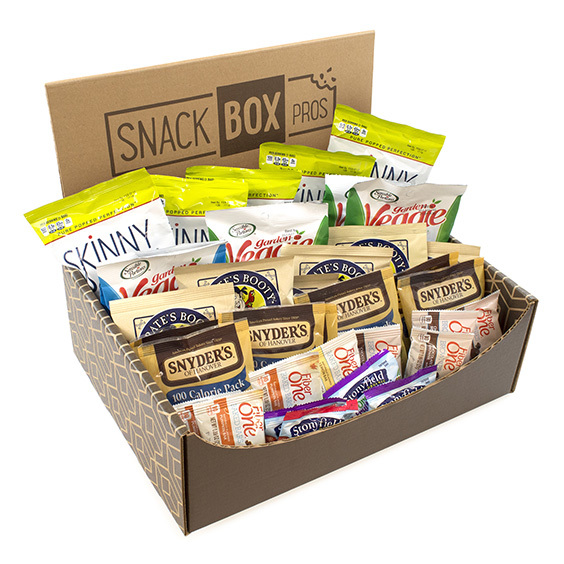 Enjoy great taste from snacks like Skinny Pop, Veggie Straws, Pirate's Booty, Snyder's Pretzels, Fiber One Bars and Stonyfield Fruit Snacks in this 37-Snack box. Tough, flavorful and packed with protein, this Big Beef Jerky Box is packed with delicious, exciting flavors of beef jerky. 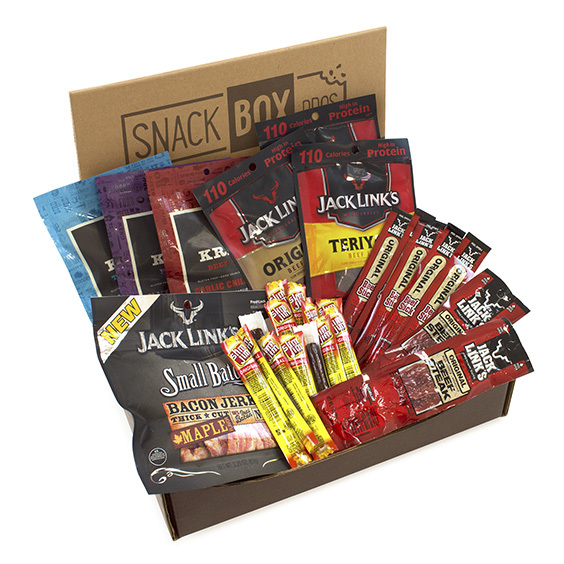 Rip open a package of Krave, Jack Link's or Slim Jim Beef Jerky from this 29-Snack box and enjoy assorted flavors of beef jerky. 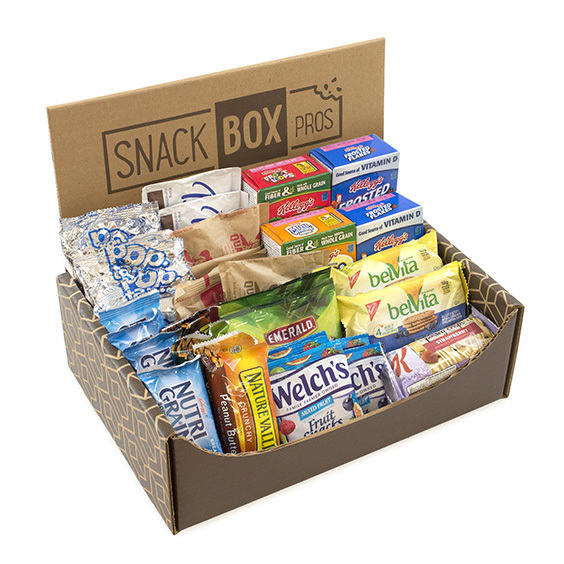 Take the added stress out of college with this Dorm Room Survival Snack Box. Perfect as a gift to the college-goer in your life, and great to buy to stock your own apartment or dorm. 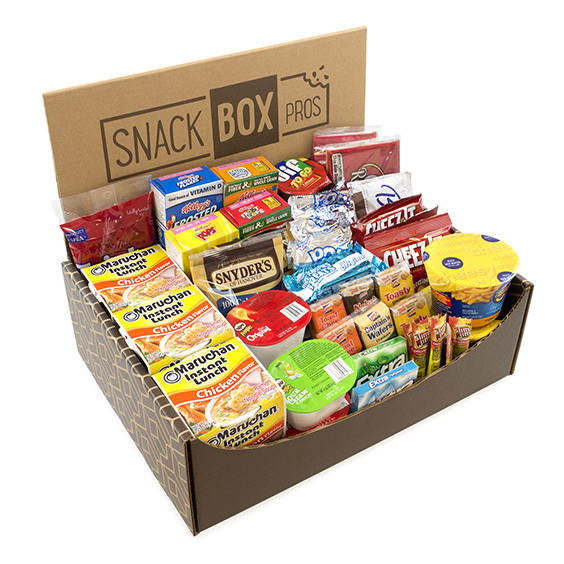 With snacks like Kraft Mac & Cheese, Maruchan Lunches, Kellogg's Cereal, Jif To Go, Orville Redenbacher Popcorn, Rice Krispies Treats, Slim Jims, Lance Crackers, Cheez Its, Pringles, Carnation Breakfast, Snyder's Pretzels, PopTarts, Twizzlers and Ice Breakers Gum, this 55-Snack box will give you enough energy to fuel you through all your classes. Don't go nuts over this Premium Nut Box! Packed with individual cans of delciously crunchy assorted nuts, this Snack Box is great for the office, gifting, or at home. Just grab a handful of either Salted Mixed nuts, Roasted Almonds, Delixe Mixed Nuts, Salted Cashew Halves, Natural Almonds or Fancy Cashews, and enjoy the rich, Superior Nut crunchy flavor. Can't decide between chocolate and chewy candy? This Mars Favorites Snack Box has you covered on both fronts. With deliciously chocolaty Milky Way, M&M's, Twix, Snickers, and 3 Musketeers, along side fruity Skittles and Starbursts, capped off with crunchy Combos, this 25-Piece box has something for everyone to enjoy! 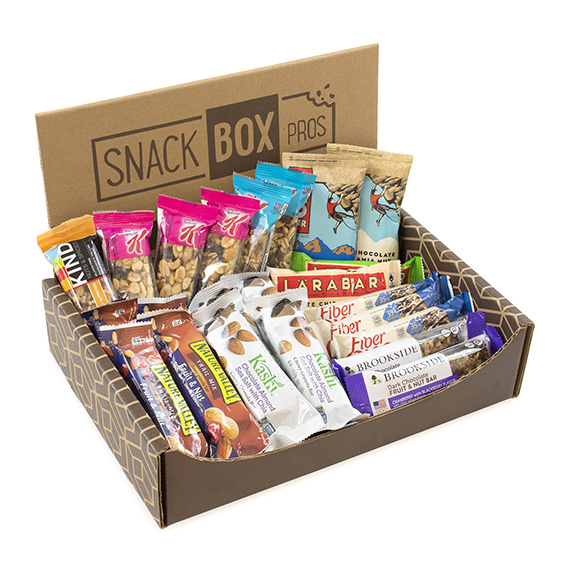 Snack smarter with an assortment of Good-For-You snacks in this Healthy Snack Bar Box. Enjoy new and exciting flavors from Kashi, Nature Valley, Larabar, Nutri Grain, Clif, Fiber One, Brookside, and Kind in this 23-Bar box. Your party won't be ready to start until your guests have a change to dig into this Party Snack Box. 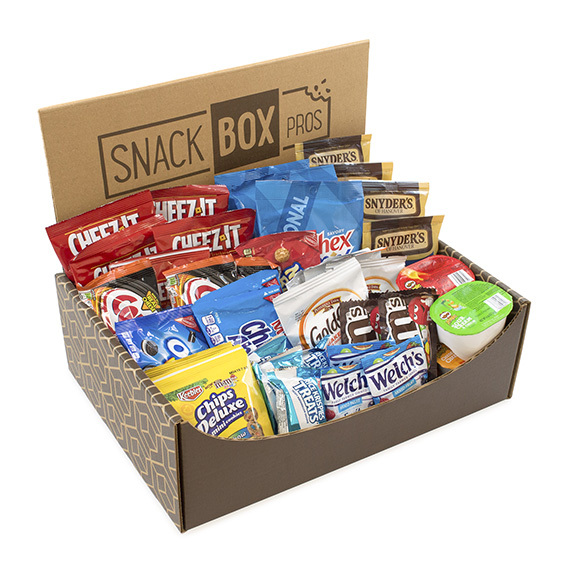 Share great snacks like Chips Ahoy, Oreos, Pringles, M&M's, Welch's, Snyder's Pretzels, Chex Mix, Goldfish, Cheez It, and Keebler Cookies with this 45-Snack box. Start your day right with any of the snacks in this Breakfast Bar Box. Wake up to great tastes from PopTarts, Kellogg's, Welch's, Carnation Breakfast, Emerald Nut, Belvita, Special K, Nature Valley, Nutri Grain and Quaker Oatmeal in this 41-Snack Box. 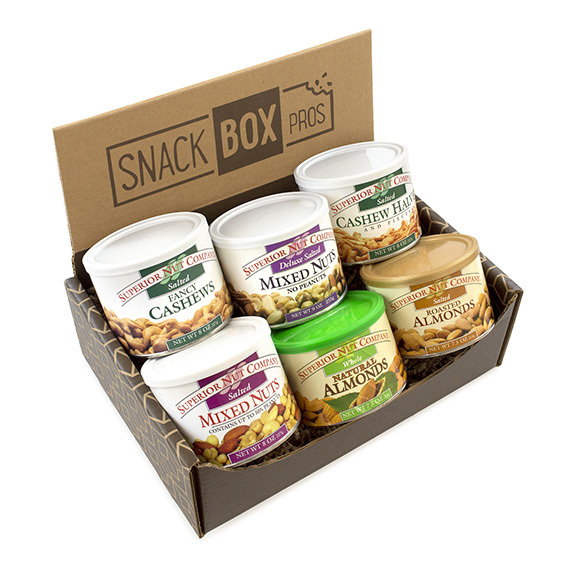 Snack healthy with the exciting assortment of this KIND Favorites Box. 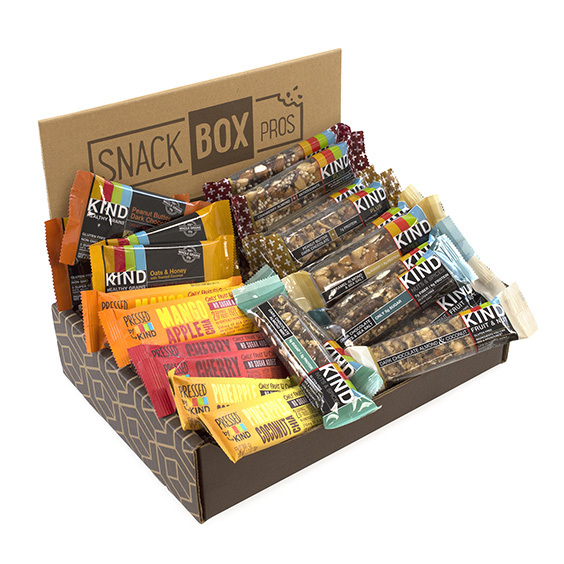 This 22-Bar Box is packed with delicious KIND flavors of their Fruit and Nut Bars, Kind Healthy Grains Bars, and Pressed by Kind Bars. Put down the junk food and pick up this healthy Kind Snack Box! Meetings, errands, commuting, parties! For someone who's always out-and-about, this On-The-Go Snack Box is a perfect fit. Just grab a snack like Planters Nuts, Secone Nature Nuts, Emerald Nuts, Apple Nut Train Mix, Lance Crackers, Jif To Go, Ritz Cheese or Kashi Trail Mix from this 27-Snack box whenever you need to snack on-the-go! No need to worry about any allergies with this Gluten-Free Snack Box! 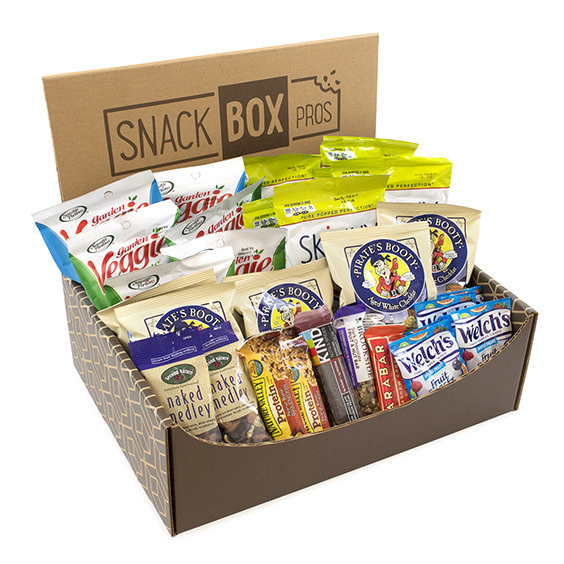 Packed with Gluten-free snacks from Skinny Pop, Veggie Straws, Pirate's Booty, Second Nature, Kind, Brookside, Nature Valley, Larabar and Welch's, this 32-Snack box has all the flavor, with none of the gluten. 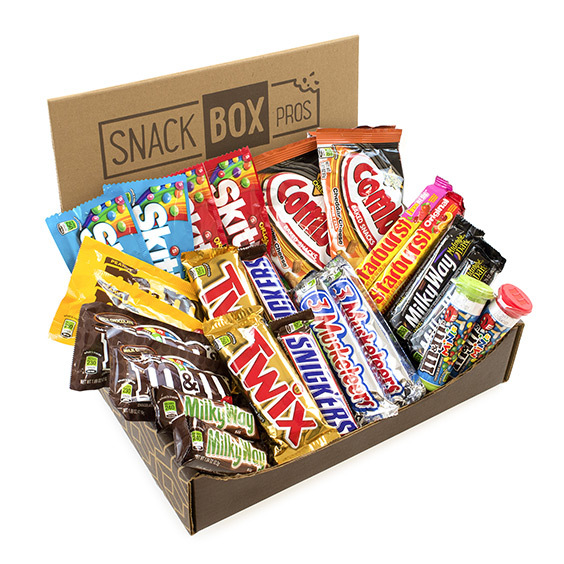 A cutting edge, unique Snack Box,filled with snacks based on your snacking preferences! We choose from over 100 different snacks and build a personal snack profile, custom to you. Snacking has never been so good!